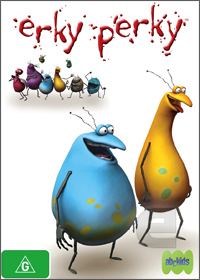 One Saturday morning while casually channel surfing, I came across an entertaining computer animated cartoon called Erky Perky which revolves around a variety of different bugs with Erky and Perky being the main characters of this entertaining franchise. The characters live in a bug city within a kitchen as they get up to a variety of hijinx such searching for food or becoming rappers. This DVD is definitely for the kids but I'm sure most adults will enjoy this strange whacky computer animated cartoon. It's funny, it's entertaining and best of all, it's kid friendly. Check it out!